I still hope for several feet of snow, but the leaves are newborn green – I can’t help but celebrate the rebirth. Today I am reminded of a short story, George Orwell’s The Hanging. In that story, a man is about to be hung. At the conclusion of the story, the hanging takes place. We know nothing of the man’s crime, and yet because of the details that Orwell includes and omits, our sympathy lies with the man. The purpose of using this story in my composition classes was to demonstrate how we can sway our readers through mindful selection of details. We were driving north on South Nevada just past Fort Carson. Traffic was heavy – the drivers aggressive. We were behind an olive-colored Saturn with two bumper stickers. My response was visceral. I didn’t like this guy. I had a strong urge to rear-end him, give him the finger, and drive away without a second thought. His politics disgusted me. And yet, I don’t like to think that I am so primitive. On his license plate I noticed the letters DV. He was a disabled veteran. Can you though a mindful selection of details, briefly tell this man’s story? Can you convince me that he is not narrow-minded and xenophobic? What experiences has this man had that have made him the man he is? What are his redeeming features? Using the brief notes/clues to whom this man might be, write two introductory paragraphs. In the first, through selection or omission of details, the reader’s first impression is that the man is a racist bigot with a big gun. In the second paragraph, flip the coin. Invent a sympathetic back-story that will make me forgive him his bumper sticker. I think about guns a lot. During President Obama’s April 16 meeting with Mexico’s president, Felipe Calderon, Obama said that he will not seek the reinstatement of a U.S. assault weapons ban. It would be political suicide to do so. Unfortunately, he’s got that right. 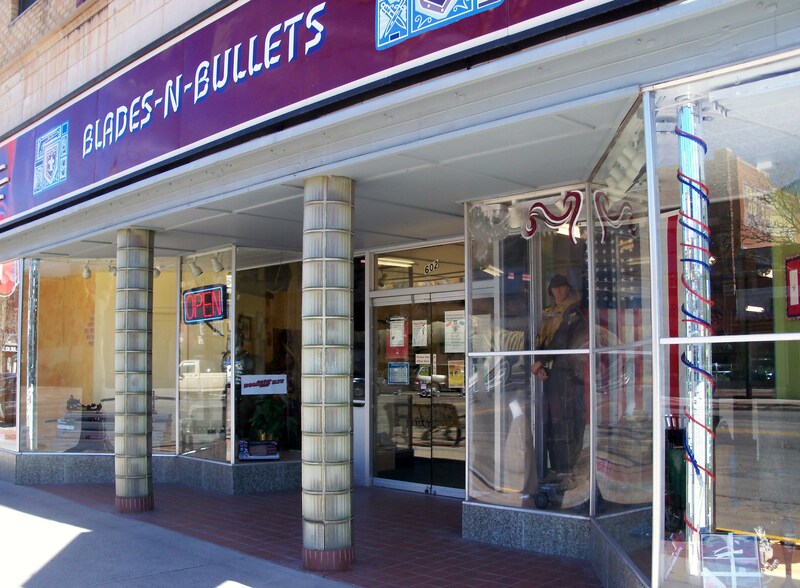 Blades-N- Bullets at 602 Main Street, Canon City, CO. I found this poster in the window (to the right of the door… in front of the American flag… above the large, ears up, German shepherd) very disturbing. God and Country in the same breath is a double whammy. I’m not in the mood to trace the context of the JFK quote, but the words are chilling. 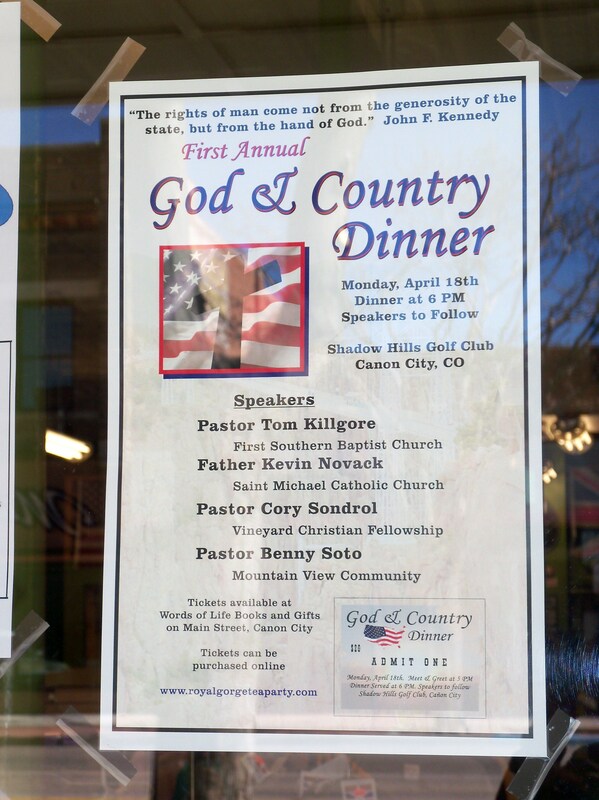 I won’t be in town for the April 18 meeting, but if I were, I would go. Just to see. Maybe to report.